Posted Mar 28, 2017 By Lauren Adams, M.A., Margo Edmunds, Ph.D. This report documents the AcademyHealth model focused on bringing innovators together, supporting them in priority-setting and collaboration, and enabling them to disseminate their findings to a broad range of audiences to leave a lasting mark on health care delivery systems research. The Electronic Data Methods (EDM) Forum began in 2010 as a way to connect 11 Agency for Healthcare Research and Quality (AHRQ) grantees working to improve the use of electronic health data to improve health care. The grantees came together at a time of great change in health IT and were funded under the landmark American Recovery and Reinvestment Act. This legislation incentivized the meaningful use of electronic health record technology and kicked off a race to harness the power of health data. 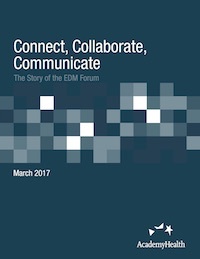 By 2016, the EDM Forum had become a community 4,000 strong, built on trust and mutual respect for diverse expertise, and committed to working together to solve some of the most pervasive issues in health care by viewing those issues as shared challenges. This community would ultimately bring together innovators on the front lines of health care from health care delivery systems and public health agencies; develop and share recommendations before the most influential federal agencies; and lead a national dialogue on critical issues such as governance, data sharing, methods and analytics, and dissemination of findings. Perhaps the most distinctive aspect of this community was its commitment to the common good. Participants were committed to improving the spread of innovation in a transparent and reproducible way. The group’s solutions are documented in more than 400 freely accessible analytic products (e.g. issue briefs, reports, peer-reviewed manuscripts) and resources (e.g. webinars, toolkits), as well as in eGEMs, a peer-reviewed, open access journal created during the project.